I hope all of the mothers out there had a wonderful Mother's Day! We had a nice day, and I finally got some time to get my nails done, which is something I only do a few times a year. I also got donuts and coffee from Dunkin' Donuts as my breakfast in bed, which was a very nice way to start the day! I finished reading Darkroom by Joshua Graham, and have a review and giveaway up on my blog still. Click on the title to enter. The giveaway ends tonight! I'm also hosting a Kindle Fire giveaway. That's through Pump Up Your Book and will be up through June 1st. I didn't get a chance to write about my kids' reading this week, so I figured I'd mention it here. My son is currently reading the fourth Harry Potter book. This one has been much slower for him than the others. I think, perhaps, he's about ready for something different. My daughter has been reading lots of early readers. Last night, she read I Spy Fly Guy by Tedd Arnold. We own that one and currently have Buzz Boy and Fly Guy from the library. We really love that series! I'm still reading Clout: The Art and Science of Influential Web Content by Colleen Jones for work. I've been picking it up off and on for a few weeks now. I'm also reading Flat Spin by David Freed, a fun mystery novel. Next, I'll be reading A Lovely Indecent Departure by Steven Lee Gilbert, a local author here in NC. Interesting selection of titles. My students really love the Fly Guy books too. My current professional book is about Google+ but I just got it and haven't even looked at it yet. Here is my Monday Report. Happy reading! Great choices!! 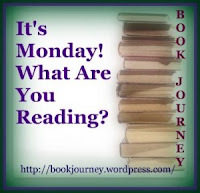 Have a wonderful week reading!! Thanks! You have a great week of reading too! I loved the Harry Potter series - and I really want to go back and read them all again. Happy Mother's Day, Julie! I had a nice day, too. Sounds like you've been busy! I will have to check out your review of Darkroom - I haven't heard of that one before. Hope your son is enjoying the Harry Potter books! Thanks! Happy Mother's Day to you too! He is enjoying the series very much, although he'll be stopping after this one until he's a bit older. My son loves the Fly Guy books too! And of course, we all love Harry Potter :-) Hope you have a great reading week. Thanks for stopping by! You have a great week too! I hate to admit it when everyone else loves *every* word J.K. Rowling has ever written, but the 4th Harry Potter almost broke me. It did break my mom. I thought it could have been cut in half. The Quidditch World Cup just dragged on and on and on! I can see why your son's interest might be waning a bit. I do love the series as a whole though! Yay for NC authors and bloggers! I'm a Western North Carolina girl myself. Enjoy your week! I'm hoping to read more NC authors in the future. I enjoy supporting them! Thanks for stopping by!